The versatility of the Satake machines for milling rice of all degrees of whiteness with the minimum brokens makes it the ideal machine for modern rice mills. 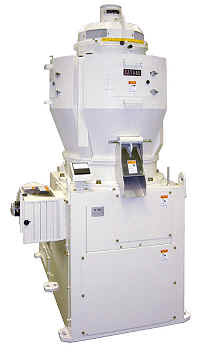 Evenly milled, higher yield rice with fewer brokens and minimum moisture loss is obtained due to the adoption of the newly developed, 'state of the art' milling chamber. The abrasive rolls are easily withdrawn out of the top of the unit, because the cantilever main shaft design makes a bearing at the top of the machine unnecessary. The screens are of a 'lift away design' which makes screen changes quick and easy and can be performed without having to remove the frame from the machine. All other parts are easily accessible and readily interchangeable. Due to the special heat treatment an the uniform and lower pressure obtained in the milling chamber as compared to conventional vertical rice whiteners, the durability of the wearable parts has been prolonged. 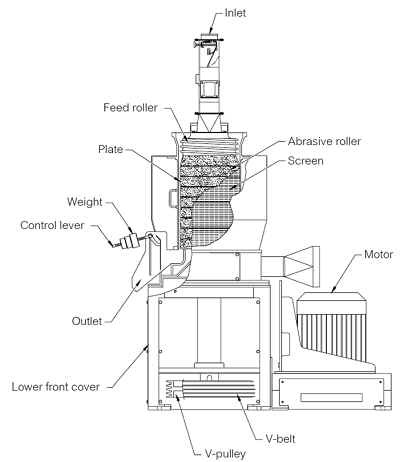 In the section below the milling chamber, there is a bran rotor valve which assists in removing the bran from the machine. The special design of the milling chamber has almost twice the milling surface of a conventional unit and allows for very high milling capacity in a minimum of floor space.